Author: Lukas Neukom. Series edited by: Anne Storch, Norbert Cyffer, M. Lionel Bender †. 10 pp. Roman, 292 pp. 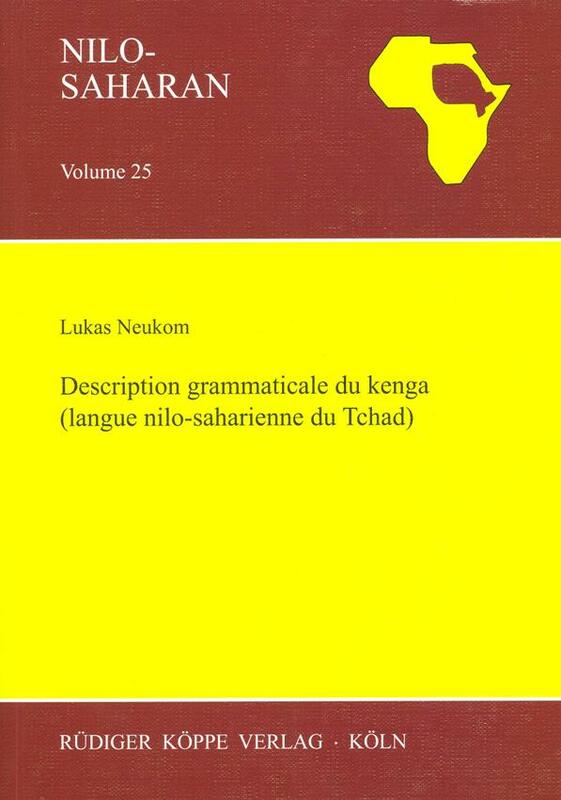 Kenga is a Sara-Bagirmi language located in the central Sudanese branch of the Nilo-Saharan language family and is considered a common language of several ten thousand people in the Guera region of southern Chad, N’Djamena and other cities. Three dialects and a highly alienated variant are documented. Kenga is a tone language with three distinct pitches. The data underlying the present grammatical description was collected by the author during his fieldwork in N’Djamena from 2005 to 2006. After giving a broad introduction into the phonology of the language, noun, verb and other linguistic elements are presented in the context of usage and construction and are afterwards applied in two chapters regarding syntax. The appendix provides several texts based on the reports of the main informants as well as an index of names and a subject index. Another edition in our programme features a comparative study of the tonal systems of seventeen Sara-Bongo-Bagirmi languages.